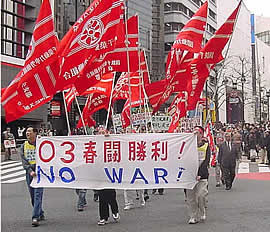 Labor union members march in a spring offensive in 2003. Photo courtesy of Doro-Chiba Union. Shuntō, The Spring Labor Offensive, was devised by the Sōhyō labor federation to strengthen the bargaining power of enterprise unions with their companies. All the enterprise unions in one industry would announce similar wage demands each spring, and begin their wage bargaining with a short strike on the same day. Even though each enterprise union bargained with its own company management, the industry-wide coordination helped to set similar wage goals across an industry. Sōhyō coordinated the day that each industry would hold its strike. This created a wave of colorful spring strike activity and an atmosphere of excitement and competition around the bargaining process. The Spring Labor Offensive was a prominent feature of Japanese labor union activity until the break up of Sōhyō in 1989.